Jani-King of Cleveland is proud to have helped Select Medical in Canton to achieve the Hospital of Excellence Award. This is a prestigious award among Select Medical facilities and the efforts Jani-King franchisees and the Cleveland office have put forth over the past year played a key role. According to Stephen Bartek, Director of Environmental Service Operations for Jani-King of Cleveland, he was confident from the beginning of taking over the account that Jani-King could get the facility on track. While franchise owners Stephanie and Larry Johnson have been outstanding, Jani-King’s support system has also benefited the Canton facility and other Select Medical properties in Ohio. Select has made our staff feel like part of their team. We are fortunate to have staff members that go above and beyond our expectations on a daily basis. Bartek goes on to commend the Johnsons by saying, “Stephanie and Larry have my eternal thanks for all that they have done as franchise owners. This achievement far exceeds anything I have experienced during my time with Jani-King. In essence, this is a big deal and I am very proud of Stephanie and Larry and their entire staff for their results at Select Medical Canton. “Working with Select Medical has been both challenging and rewarding,” said Stephanie Johnson. “Select has made our staff feel like part of their team. We are fortunate to have staff members that go above and beyond our expectations on a daily basis. This has been challenging because it’s our first hospital. But it’s so rewarding because we are doing a very important function for Select Medical and their patients. We have had great support from Jani-King operations as well as Select Medical’s management team. This is what it takes to build a great partnership and lasting relationship. 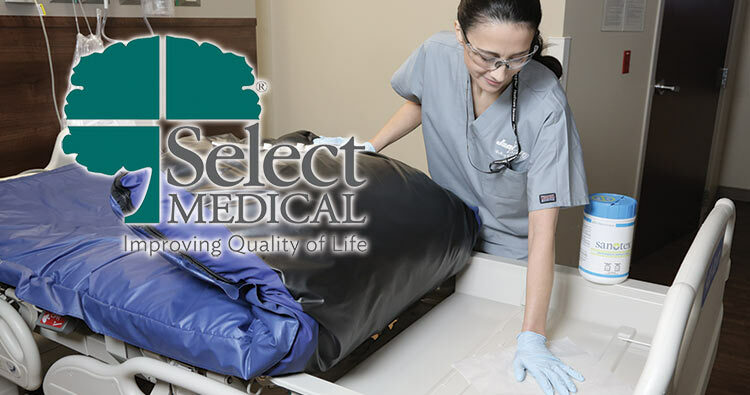 We look forward to continued success with Select Medical now, as well as, in the future.